Drink bottled water? I know many of us parents do. It's just so darn easy to grab a bottle of water when you are on the go all the time. I've also been doing some hefty summer traveling, which contributes to an increase in my bottled water intake in the car, on the plane, etc. However, it's news like this that continue to make me think twice about buying it. Wherever you stand on the issue, it's important to be informed. Consumers know less about the water they pay dearly for in bottles than what they can drink almost for free from the tap because the two are regulated differently, congressional investigators and nonprofit researchers say in new reports. Both the Government Accountability Office and the Environmental Working Group, a nonprofit research and advocacy organization, recommend in reports released Wednesday that bottled water be labeled with the same level of information municipal water providers must disclose. The researchers urged Americans to make bottled water "a distant second choice" to filtered tap water. Click here for the rest of the story. During a recent trip to Whole Foods, I came across Odawalla's Superfood Juice, which is green juice with blended green plants and strawberry, peach, mango and banana purees and apple juice. It also includes a 1,000 mg of spirulina per serving, lots of Vitamin C, Manganese and Potassium. On a whim, I bought some wondering if my daughter would try it. She loved it. I mean, really loved it. Because the Odawalla juice is more expensive, I turned to Trader Joe's to see if I could find a similar juice that's a little lighter on the wallet. I found the Green Plant Juice to be almost exactly the same. Tastewise, I still prefer Odawalla, but the ingredients are almost identical. The only difference really is that the Green Plant juice has less spirulina (620 mg) and pineapple juice in lieu of the strawberry puree. If you're like me, then you probably already have your nose turned up. Green juice, ICK! Trust me, I was skeptical, too. But then I realized that I could give her a little green juice on those not-so-nutritious days like yesterday, for instance, when she ate only French fries for lunch. I gave her a glass of green juice when we got home from In 'n Out Burger, knowing that hey, she's at least drinking some spinach, broccoli, mango and peach. And then I didn't feel SO bad. As a kid, I constantly bugged my mom to buy Strawberry Quick. The commercials wooed me first, and then I had it at a friend's house. I wouldn't stop talking about it. And now as an older, more mature version of myself, I understand why my mom vehemently opposed -- the sugar, of course. It's taken me up until recently that I can make my own strawberry milk. All you have to do is blend up some strawberries with your favorite milk...and duh...you can have close to the same thing, only healthier. We have been making it with Unsweetened Vanilla Soy Milk, which adds a nice vanilla taste. It's even better with frozen strawberries (so freeze those super ripe strawberries before they go past the point of no return). **Best to drink in regular cups with straws as strawberry seeds seem to routinely get stuck in sippy cups, which may subject one to an angry toddler slamming their cup on the floor out of frustration (or maybe that's just my daughter's reaction). It's so simple, so easy and has quickly become an addiction. And many thanks to neighbor Kim who introduced me to this concept during a recent playdate. A great drink for you and your little one to share on this Mother's Day! News Alert: Is Starbucks the New After-School Treat? 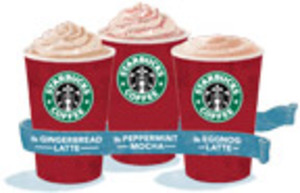 Starbucks, the new after-school treat? Please tell me it's not. Well, apparently it IS catching on with the grade school crowd. After thinking about it for a bit, I guess I can understand why. Kids want to be like us, and we get coffee at Starbucks. Or if your kids don't see you going there, they see Britney and others going. 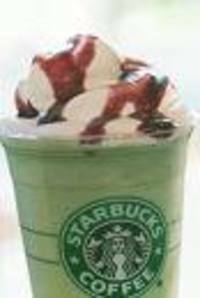 And with frappuccinos and the like, it's a dead giveaway that kids would go bonkers for those drinks. Not only is it a high caloric habit, but it's an expensive one, too. And do we really want our kids to be hyped up any more than they already are? Not so much. As parents, we worry about what our little kids eat. The below article gives good cause to paying attention about what they drink, too. Excerpt from "Is Starbucks the New After-School Treat?" "Keep an eye on what your kids are drinking and educate them on what caffeine can do to their nervous systems. Encourage them to drink more ice water, low- or non-fat milk, and 100-percent fruit juice (you can dilute the juice to save some calories while still getting some of the flavor). Your kids don't need caffeine to do their homework. " Click here for the rest of the story. 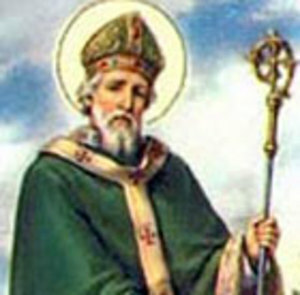 Happy St. Patty's!! To really get your Irish on, I've listed a number of links to top-rated St. Patty's dishes from around the web. Enjoy! Colcannon - A traditional Irish potato dish. St. Patrick's Day Cookie Pops - Fun and easy recipe to do with kids. Shepherd's Pie - Traditional English dish, which is a tasty option for celebrating St. Patty's. White Soda Bread - Try a little Irish soda bread for the celebration with hard Irish cheddar and Irish butter. Now raise a Guinness and say "God bless all here!!" My obsession du jour has to be hot chocolate. Or should I say, liquid chocolate. I'm not talkin' Swiss Miss here. It's the real deal, the good stuff. Because if you are going to indulge, you should go all the way. Right? I suppose my obsession began in 2005 while pregnant with my now toddler. The hubby and I went to NYC for a last hoorah. I couldn't drink, so I needed another vice for the week. And hot chocolate it was. We went to Jacques Torres Chocolate Haven, which is a chocolate paradise run by New York's own "Willy Wonka" who is none other than Mr. Torres himself. We actually got a glimpse of him making chocolate in the factory. In our foodie nerdom, we whipped out our camera and got a few shots of him. And whoa does he make a good cup of chocolate! Heaven right here on earth. Then, we went to Vosques whose hot chocolate was equally as impressive. Why more people don't talk about hot chocolate like this is beyond me! **Note that you can buy hot choco from both of these folks online. So here I am on my couch with a cup of my own hot chocolate (regular cocoa mix plus a few squares of a Noir dark chocolate bar from Trader Joe's). I swear that this is like liquid Prozac. My mood suddenly is lifted, and I feel like all is right with the world. 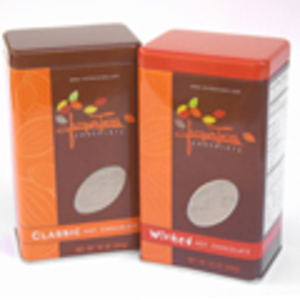 - Hot cocoa actually has more antioxidant power than green tea and red wine based on a 2003 study. And ladies, from my own experience this past month, it helped with PMS. So mommy was more mellow and actually, dare I say, pleasant to be around. So if scientists at Harvard are calling cocoa "the next wonder drug," I say BRING IT ON! P.S. Whining and Dining will be doing a search on the best hot chocolate in LA and will also be trying to find a healthier, less sugary but still rich hot cocoa. You'll be the first to know what I find out. In the meantime, give me a shout out if you have any leads in LA or online. It was a great morning today. Why? Because I discovered that it is officially holiday drink season at Peet's today. My non-fat Gingerbread Latte was as good as ever. I was smiling on the inside and out. Just thought I would pass it along to all of you parents out there who need a little pick me up /splurge over the next few months. Despite the picture of the Bucks' trio of holiday drinks, I do think the Peet's Gingerbread Latte is superior to them all. Wishing you a happy start to the holiday season! Last January, we experienced our first weekend away from the baby at the Ojai Valley Inn & Spa in Ojai, CA (www.ojairesort.com). The spa treatment was a piece of heaven, and the accommodations were absolutely incredible. Not to mention the good food and wine. And the specialty drinks from Brian "the Martini Guy." It even rained the entire weekend and it still was just amazing. When it was time to get back to reality, I longed to bring a little bit of spa home with me. So, I began making the below spa water based on the delicious, refreshing water served in the Ojai Spa. This is the only way I can get even close to reaching the daily requirement of eight glasses of water a day (a relentless struggle that has angered my stone-producing kidneys). Experts do say that lemon water is great for preventing kidney stone formation and raising metabolism. The cucumber gives a calming effect and takes me back to the Ojai spa. 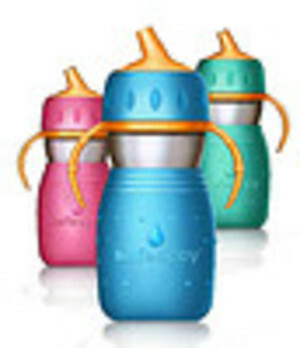 **Nursing moms - try this to quench your thirst! Flavored water is all the rage these days. Why wouldn't it be? You just don't have to break the bank to drink it.